While Wednesday is normally a half-day of classes back at Gill, we had a full day of learning in Praia do Forte! With Portuguese lessons from Isabelle and a photography workshop with Javier, we felt ready to say bom dia to the rest of the day. 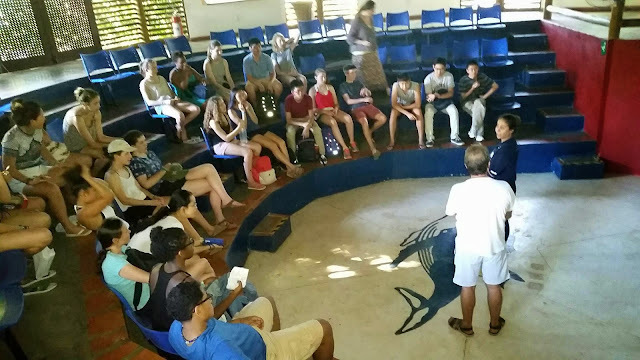 Javier then led a seminar on the history of Praia do Forte, from its 16th century past as the largest latifundium in the Western world, to its modern history as a resort town built up by one German investor starting in the 1960s. The group was left pondering complicated questions about the economy of the town, and the larger socio-political trajectory of Brazil. After lunch, the group finished their discussions on "Gabriela, Clove, and Cinnamon," the 1958 novel by Bahia-native author Jorge Amado. The novel hits on themes of love, lust, and loyalty in a small town just north of Praia do Forte. Yesterday, they discussed in particular the significance of racial distinctions in the novel, and the roles of mulatto and black female characters in the text. We then heard presentations from Eve Pomazi '17 on the economy of Brazil, while Malcolm Cochran '17 followed up with a discussion on off-shore oil exploration from the world's 12th largest producer of the commodity. Eve introduced the group to common economic terms before discussing Brazil’s economic history and trajectory. The group had great questions for Eve about the relative weight of oil to the overall economy, the causes of inflation, and the poverty rate relative to other countries. Malcolm further helped us understand the role of oil to Brazil’s economy, and explained that despite the large amount of petroleum produced in the country, it must be refined elsewhere for productive use as gasoline. Malcolm also discussed the role of Brazil’s dominant petroleum company Petrobras. The fact that Petrobras sponsors many of the environmental projects was not lost on our ever curious students, as many of them questioned the sincerity of such moves. 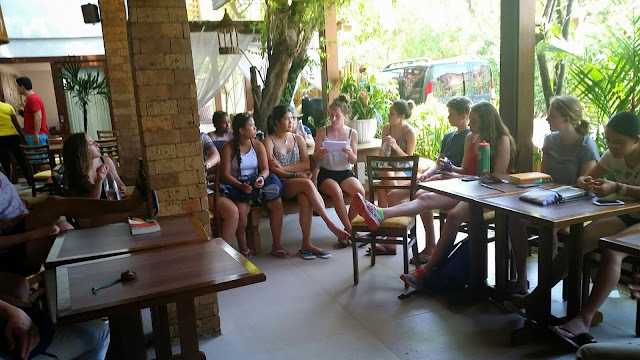 The group then had time to work on their projects for Religious Studies, as they split off to discuss the aspects of Judaism, Christianity, Islam, Indigenous religions, and Candomble that they have observed in the country thus far. The groups then planned on ways to do further active research in the remaining week, including opportunities for interviews and purposeful photography. When they return, students will present on their religion's influence on Brazilian history and contemporary society. We finished the evening with a visit to the Whale Institute, where we learned about the endangerment of humpback whales that come to Bahia for breeding season. After another hearty dinner, the group was treated to farinha. The dessert is a traditional dish of the area, and is prepared on a wooden stove. While we were all full from dinner, we found room for the tasty treat. For our nightly reflection, we considered one word to describe how we're feeling at mid-way point of the trip. On Thursday, we depart for our next location of Itaparica!